An opportunity to acquire an updated and well-maintained Sweden Yacht 36. A sailor that fits as well a sunny day in the Swedish archipelago as in hard weather on the Atlantic. Built by Sweden Yacht in Stenungsund 1989, with a beautiful hull and mahogany decoration. The sailing characteristics are well documented very well. With depths of only 1.65 you will find many beautiful natural ports. The boat is well-equipped, well-kept, and always winter-kept indoors. Spent several summers in his boat house due to other projects. She usually sails in the Bothnian and the Bothnian Sea. In addition, a powerful boat cart is offered in conjunction with a purchase. Equipment List SWY-36, No. 1068. * Selden Mast, Masthead, Double Spread, Baby Tag and Bardoons. * Rodkick with kicking strap. * Double Spinnaker Fallout, Double MainFallout. * Deck lighting in lower diffuser pairs. * Double wind sensor, and Vindex, in mast peak. * Three coulor Topp light. Combined with white LED for anchor light. * Separate engine lantern on the puschpit and top lantern in the mast. * All wire struts fitted with aluminum pipe protection. * Backstay-tensioners mechanically. Served and the review with new bearings. * Lazy jacket for main sail. * Radar post; with Radardome, Lifter for outboards, TV Antenna, AIS Antenna, GPS Receiver, Solar Cell with regulator, 2 st. LED headlights, and Horn. * Mainsail with Full-length battens. 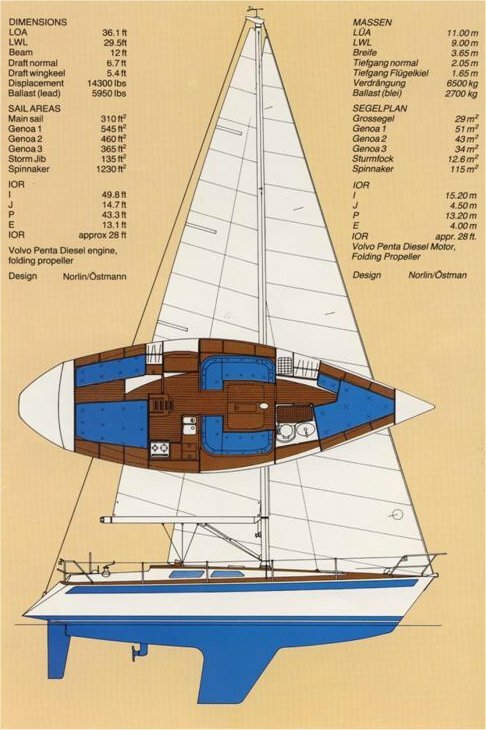 * Mainsail with conventional battens and three reefs. * Fullgenua No. III, in Mylar. * Roll genua No I, on the Selden Furlex Proof Profile. * Spinnaker, complete with Stockings, Bom, Gajar, Block, Up and Downhaul. * The hull built on Lloyd's Certificate, with No. 1068, Sandwich hull, with heavy floor bottom timbers. * Homogeneous Lead keel with Wing. Draft is only 1.65 m. You can access many shallow harbors and bays. * Skeg with the rudder on the overall stainless steel shaft. * The hull epoxy treated: - Blasted, ground.- Acetone Washed.- Painted 2 times with JOTUN Penguard primer. - Painted 5 times with JOTUN Jotamastic 87. - Painted 2 times as top layer with JOTUN Vinyguard silvergrey 88.- Painted 2 times with HEMPEL Mille Performer as UV surface layer; In connection with epoxy treatment, all hulls and valves tub change, performed in 2008. * Big Wheel, with leather upholstery, on Edson Control Pedestal. * Foldable cocktail table, with drink holder for 4 pcs. mug. * Tyres in Sandwich, coated with homogeneous 12 m. Teak, and Aluminum profile in bulk. * Bathing platform in the stern, dressed with Teak, Swimming ladder, Hot and cold water shower. * Pointing, with retractable pole ladder and bracket for Anchor and Genacker. * Lifting loop with lifting strap, for center lift of the boat. * Genoawinchar, Lewmar, large 2 Speed, Self Tailes. * Big Scotwin and Fallwinchar, Lewmar, 2-speed, Self Tailes. * Windlass, Lewmar in the bow with 60 m. 8 m.m. chain. Anchor box, with pump for anchor and tires. * Bowe anchor Bruce 15 kg, lies on geantly strong point. * Stern anchor Bruce 15 kg. 18 m.m. multi teams line. * Reserve - Big pull 15 kg. * 6 Large Fendrers with Blue Socks. ENGINE, POWERLINE and CONTROL-INSTRUMENT, - New 2011. * Volvo Penta D1-30F, Freshwater Cooled. * Electricity cables, Controls, and Instruments. * Drives Volvo Penta 130S-B. * Folding propeller 2-leaf, Volvo Penta. * Fuel hoses and pre-filters from the fuel tank. * Exhaust, Cold and Hot Water Hoses. * Carpentry and furnishings in mahogany. * Blue plush upholstery throughout the boat, in a nice and well-preserved condition. * Ship barometer and ship watches, one of which has timed by satellite signal. * Double stainless steel sink. * Gas stove with double burner and oven. * New gas hoses, Gas alarm, exchanged 2016. * Large 125 liter Kyl, with Danfoss BD compressor. * Electric pressure water pump for cold and hot fresh water. * Additional manual foot pump for fresh water, as well as manual foot pump for sea water. * Water Toilet, Jabsco 2000, with reverse valve lock. * Stainless Holding Tank, with suction hatch and deck connection. * Large wash basin with Hot and Cold Fresh Pressure Water. * Shower on the toilet with Blidgepump. * Stainless Freshwater tank 200 liters. * Stainless Fuel Tank Diesel 150 liters. * Hot water heater 25 liters, heated via Motor and - or Electric. 220 volts. * B & G, Wind Instrument with Timer, Voltmeter. * B & G, Log with Tripp and Anchor function, depth sounder, sea water temp. * Philips GPS MK8. at the hub. table. * SUUNTO Compass on pedestal. * Radar Raymarine HD Digital Radome, Color Degrees 4 kW. Connected to plotter. * Plotter Raymarine C120W, wide multifunction display with widescreen. * AIS TRUE HEADING CTRX Class B transponder, connected to plotter. * Raymarine ST 60+, Wind and Cross Instrument, Depth Instrument, Speed Instrument. * Landströms Equipment 220 Volt, with sockets in Kitchen, and Navplats. * Battery Charger 35 Amp. MASTERVOLT CHARGEMASTER, Full Automatic Charger. Three automatic Stages; BULK, ABSORPTION and FLOAT. Batteries; Fully wired type. AGM. 4 pcs. - Three for lighting and one for starter with divider. separated by 2 pcs. Main switch. - New 2015. * 12 Volt Output On; Navigation location, lounge and driving range outside. * Lighting fixtures in the kitchen, forepeak, wardrobe, lounge and all bunks. * Sony DAB Digital Stereo Radio, CD, MP3, iPod, With Speed Dial and Remote Control. * Speakers in Lounge and Cockpit. * Digital TV, 20 ", DEMTEC Widescreen. * Raymarine Smart Pilot ST 6002. Connected to Rudder Shaft. * Eberspächer D3LC, Diesel Heater. * VHF Radio, Shipman 8100-Fixed. * Life raft, PLASTIMO OFFSHORE 6 man in container, designed for ocean use, self-propelled, roofed, double pontons with airtight interior, double-floor, large barrel pockets. * Manual bilge pump in cockpit. * El. bilge pump in carnivores. * Wooden plugs of different dimensions. * 6 pcs. Life jackets. * Safety belt for rear end, SB and BB side. * Fire extinguisher 2 pcs. in the lounge and the cockpit aft. * 2 pcs. of living pole on stern pulpit, one of which is with flashlight. * Outbordar bracket on stern puspit. * Flagg for the entire rig. * The boat has always been indoors, even by the previous owner. * Rig-Sail-Motor-hull maintenance etc, has been handled by current owners in recent years. * In the blue décor line at the port freeboard, there is a manufacturing error, a beauty failure, which can be seen at a certain angle of light. * 11 years ago, an easier grounding was made. The damage and the plastic job were remedied by DM Marine. For a better performance than new. * Note! Service and updating of the lifeboat is inherited. * In addition, a powerful custom-built boat cart can be offered with a purchase.